I loved the Lettering Delights clipart used by Teacher Bits and Bobs to create a math activity called "Eat Drink and Be Hairy." I decided to use the same pictures to create a number pattern activity. I think creating and extending number patterns (counting by 1's, 2's, 5's, and 10's) are essential for building number sense. Here's a little activity I've been working on. If you download it, and like what you see, please leave me a comment. Thanks! I love this! Too cute! Thanks for sharing! I just discovered your blog! Thank you for the cute activity. I just found your blog and LOVE it! Thanks for sharing great ideas!! 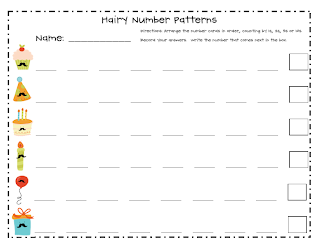 Fun and different way for students to practice number patterns! Thanks!